Today’s guest blog is from Adrian Price-Whelan. Adrian is a graduate student at Columbia University’s Department of Astronomy. As a former research scientist with the Sloan Digital Sky Survey (SDSS), Adrian became interested in large survey science and statistical inference in large data sets. He is currently working on projects in time-domain astrophysics using data from the Palomar Transient Factory (PTF), but is interested in a constantly-growing list of astrophysical topics that incorporate theory, observation, and instrumentation. Outside of research, Adrian enjoys playing and writing music, programming, teaching, and bicycling around Manhattan. Imagine yourself as a new user on Planet Hunters. You’re just starting to get familiar with the data when you come across a light curve with some features you don’t recognize. It doesn’t look like a transit, but it definitely isn’t noise — what is it? Enter Zoonibot! Zoonibot was conceived as a sort-of “Planet Hunters butler,” for Talk able and ready to automatically answer questions and provide detail when users request information. It all started at the .Astronomy 4 conference in Heidelberg after just a few hours of planning, and after spending the rest of the day (and night!) writing code, Zoonibot could perform 2 functions! 1) He is able to respond to users who request help by commenting with a #help hashtag and 2) he can cross-reference sources flagged as “transit” or “planet” to see if they are actually known eclipsing binaries. But our ideas didn’t stop there! One idea for some more advanced behavior is to build in some data analysis tools. Consider an example — given the case above, let’s say you comment on your mystery object with a question: “What is this object #zoonibot? #help!”. The hash tags tell Zoonibot that someone needs him! In this example, Zoonibot could do some simple data analysis with the light curve data and try to classify the type of variability, producing an automated response to the user with his interpretation of the data. 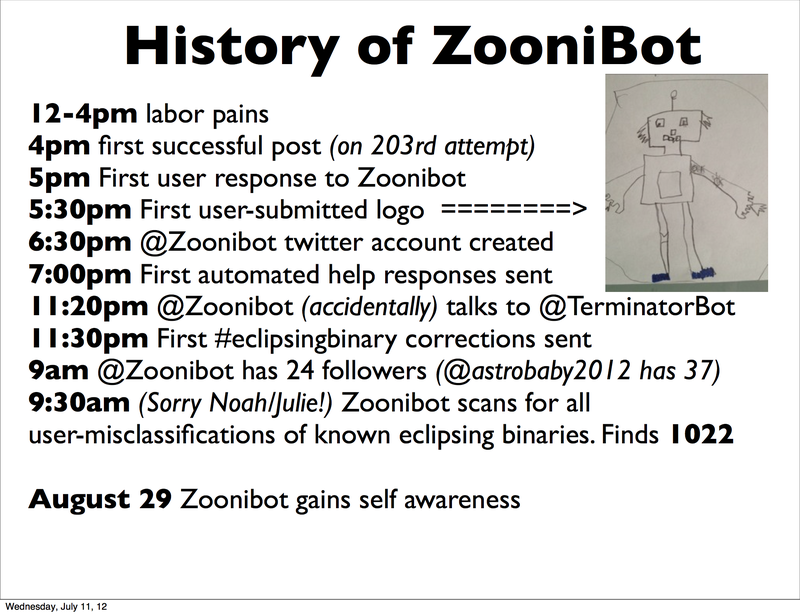 We will certainly provide another update when there is more to tell about the life of Zoonibot! – Adrian Price-Whelan, Chris Beaumont,Gabe Perez-Giz, Chris Lintott, David Hogg, Meg Schwamb. I for one welcome our new zoonibot overlords.